I thought I'd already published this post, but the nail art only made it to Instagram...oops! The nail art today walks the line between sophisticated and completely gaudy. So I've dubbed it "sophistifunk" (in honor of Outkast). 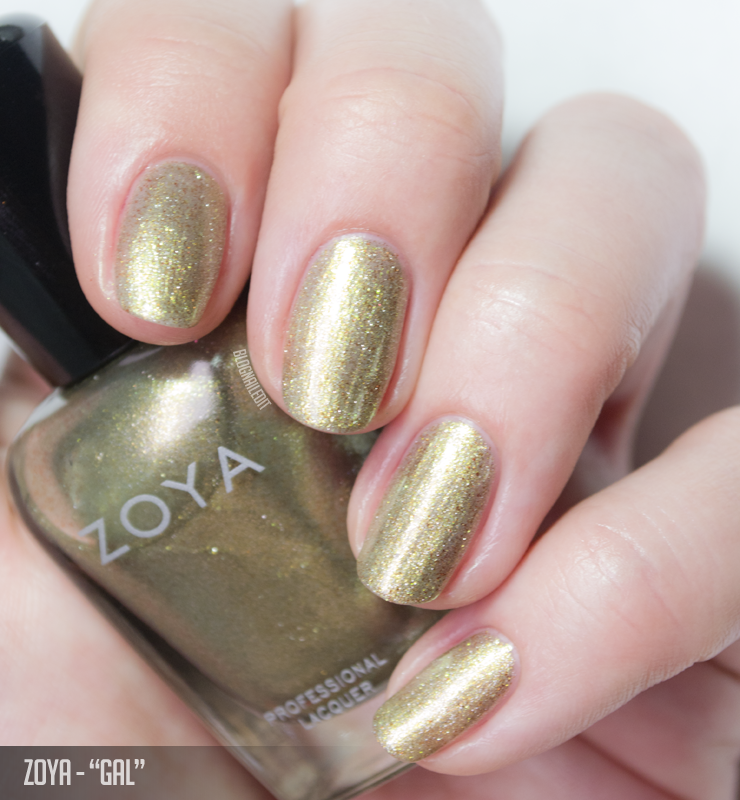 Makes sense for the collection from Zoya I'm reviewing today - Sophisticates. I used Tabitha and Gal from Sophisticates for the colors in this look. Then, over Gal I used a black from Konad to stamp the reptilian pattern with the Winstonia W101 plate. Finally, I cut and laid this small gold chain around the edges of the stamped nails to top off the gaud. I'm really curious about everyones' opinions on this...gaudy or nah? Regardless of how you feel about the nail art look, the Sophisticates collection has a color for everyone, so let's take a look at the swatches. Beth (2 coats) is definitely unique and sophisticated. It's a pretty mauve with a rose gold shimmer. Elaine (2 coats) is a cool, dark chocolate brown. It's silky smooth, like most of the cremes in this collection. Gal (2 coats) is a metallic, almost like a tarnished green silver. There are flecks of gold sprinkled throughout as well. Hadley (2 coats) is a smooth and super dark teal denim creme. Hera (2 coats) is a cheerful yet muted medium rosy creme. When I say "medium", I mean it's not too light, not too dark. Joni (2 coats) leaves the rosy realm that Hera inhabits, leaning more deep mauve. Like the others, the creme is super smooth. Mona (2 coats) is a beautiful, rich, dark maroon creme. Padma (2 coats) is the darker sister of Hera. It's a little more of a red-tinged dark rosy creme. Presley (2 coats) might be a new favorite neutral for me. It's a light-medium mauve creme. I thought it would look terrible on me, but its softness was stunning after all. Tabitha (2 coats) inspired the nail art for Sophisticates. Its dark, forest green metallic finish reminded me of dragon scales, so the sophistifunk nail art was born. Finally, Yvonne (2 coats) is a dark, brickish red creme polish. Regardless of how you feel about the nail art, Sophisticates should definitely spike interested in some. Whether you're a creme addict or a metallic junkie, there's a color for everyone. Pick up your favorite from Zoya.com here! Oh wow i came here because it reminds me of GOT hahahaha help me xD!